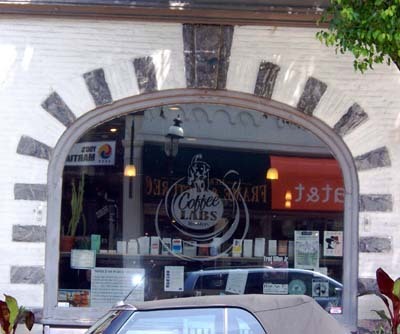 This is our third coffee from Coffee Labs Roasters (www.coffeelabsroasters@mac.com or www.coffeelabs.com) and we were looking forward to trying it. The other two we had friends try with us and they liked them, so this time we decided to brew, taste and review this coffee a little different. We actually ended up using four different brewing methods over a few days. We planned on enjoying the coffee with friends and none of these friends brew their coffee with anything but an auto-drip machine. So that is what we used. They are all used to drinking grocery store pre-ground coffee and buying whatever is on sale. One friend says he doesn’t like decaf and can tell the difference. It would be a good test group and I love a challenge. I asked them to smell the beans in the bag and then after I ground them. They kind of liked this exercise and then we talked as the coffee brewed. After pouring everyone a cup I asked them to taste the coffee before they added cream and sugar. Of all seven of us, only one person used cream and sugar. Everyone liked the taste and they were surprised at how good it was for a decaf. We know that decaf does get a bad rap and that’s one reason why we keep looking for that excellent decaf. The non-decaf drinker couldn’t believe it was a decaf. He thought it was strong, had a good flavor and he wanted another cup. Someone else thought it was a smooth, even cup of coffee and it had a good taste. They would buy this if they had a grinder. Another friend thought it had a little bit of a smokey taste, but not burnt. Overall everyone liked it and I hope we showed them how easy it is to take good well roasted beans, grind them and brew fresh coffee. At home Kim and I then brewed it in the French Press. There is a smokey and slight chocolaty taste to the coffee. It isn’t really sweet but doesn’t need any sweetener added to it. It has an even feel in your mouth and a mild aroma. The beans look dark, but the coffee does not taste like a dark roast. It is quite surprising. We would give it two thumbs up. Then we brewed it in the Chemex and the natural coffee flavor shined here. It has a mild aroma and to me a little bittersweet taste. This would be a good complement to eating a sweet desert. It has a nice taste that makes you think about what you are drinking. Two thumbs up again. Then we tried a new brewer we just got called the AeroPress Brewing System. It brews espresso style coffee, but you can add water to the coffee cup to make American coffee. We have to get used to this brewer and we will have a review of it up on the blog soon. This reminded me of the Chemex only much stronger. The espresso we made was very strong and not bitter at all. I know some of you think we’re crazy for making espresso with decaf. The coffee flavor really came through with this brewer. Two thumbs up again. So we brewed the Brazil Decaf four different ways and thoroughly enjoyed it. We shared it with friends and all of them enjoyed it. If you are looking for a city plus to full city roast water processed decaf this Brazil Daterra from Coffee Labs Roasters in Tarrytown, NY would be a very good choice. We received this coffee for free and offer objective feedback. We’ll keep exploring new places and trying decafs looking for that excellent cup of late afternoon or evening coffee. I’ll keep writing about our coffee tasting experiences too. So until next time, stop and enjoy the coffee and conversation.